Who is that guy at the bottom of the browser-window? You own a WordPress-Blog and you love blogging. So do I. One thing that makes blogging so much fun is discussing your articles with your readers. But, thanks to spammers and spam-bots, receiving comments and trackbacks can also be a really hard pain in the a**. That’s why WordPress-plugins like Akismet and Spam Karma are necessary, if you don’t want to spend more time on deleting spam than on creating content. If you don’t already use them, I strongly recommend you to do so! Recently, I encountered a new type of comment that I would also consider as spam. On these particular cases, I think, real persons were writing those comments. They really matched the contents of my article. At first, I felt quite lucky, receiving so many comments from so many new readers. But when I took a look at their URIs, I saw that they were linking only to commercial sites. As their comments don’t contain the usual “spam-keywords” and in-text-links to other sites, Akismet and Spam Karma seem to have problems to recognise those comments as what they are: Spam! I’m the boss here at my blog and I don’t like spam. I’m blogging, because I want to get in touch with real people, who care about what I write. These commenters don’t care what I write about. They want their sites to receive blog-traffic from my blog. I don’t want to support this, that’s why I wrote this plugin. 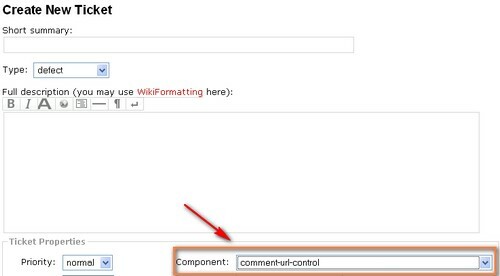 This plugin is intended to make the comment-moderation for the blog-owner a little bit easier. It does not detect comment-spam on its own. To successfully prevent spam, it should be used as an addition to the spam-protection provided by Akismet and Spam Karma. This plugin will allow you to remove unwanted author-URIs entered by a commenter with one single click of your mouse. This plugin adds a small button to every comment. This button will only be visible to a logged-in blog-admin (that is a registered user with a user-level of 10). When you press this button, the URI of the commenter will be replaced by the URI you can specify at the plugin’s option-page. After that, both files should be located at that directory. Do not create a subdirectory to store the files there! Now, go to the plugins-section of your dashboard, look for the entry called Comment URL Control and press activate. Enter your own preferred URI, make your selection about the nofollow-attribute and press Save. To get this plugin working, you have to adapt your theme in two places. Luckily, both can be expected to be in the same file — the one that is responsible for the display of comment. If you log in with your-admin user, you should see the new button appear under each comment. If you press the button on one of the comments, the URI for that particular comment-author in that comment will change to the URI you specified in your options. If you press the button again, the original URI will be back. It’s the German Minister of the Interior, Wolfgang Schäuble, looking for terrorists and other villains. Very interested with you comments plugin. Could you please me your comments.php? I’m appreciated for that. Thanks. why do you need my comments.php? If there is a problem with my plugin on your blog, could you please provide more details in a post in the ➡ forum? Thanks for the plugin. I managed to get it working and it’s helped me restrict some questionable comments (posters). Thank you and keep up the great work! You must be <a href="/wp-login.php?redirect_to=”>logged in to post a comment. Hmmm … The plugin will not work with this code. Could you please store your complete theme somewhere in a zip-file where I can download it? I think, the plugin-code needs to be added in another file from your theme-package.